who are really thieves bent on snatching the real painting. Filmed At: Screen Gems Studios, Hollywood, CA and at Fred Niles Film Studios, Chicago, IL. “Randy Scouse Git” Written by Micky Dolenz; Produced by Chip Douglas. “Day Dream Believer” Written by John Stewart; Produced by Chip Douglas. At the pad, Peter paints a picture of a door that looks so real that Micky crashes into it hurting his forehead. Since Peter has taken up painting as a hobby, Michael suggests that he goes to the art museum for inspiration by the real painters. Peter takes his advice and at the museum he paints another door that too looks so real that Chuche, a guard, bumps his head as he tries to walk through the painting. The angry guard grabs Peter and makes ready to slug him when Duce, another guard, intervenes. Wanting to use Peter's talents for a scam, he flatters Peter and showing him another portrait, stating it’s more worthy of his talent, he suggests that Peter paints it and he nearly does (literally). Duce convinces Peter to paint a copy of the portrait and then informs Chuche of his plan to switch Peter’s copy with the masterpiece, sell the real masterpiece and make a fortune, and buy tickets to Europe. Peter does paint a copy but adds Michael's wool hat to the portrait as a finishing touch and to avoid the curator, the guards decide to hide Peter in the basement while he fixes the portrait. The next morning, while having their breakfast with Mr. Schneider, their pet dummy, Michael, David and Micky realize Peter still isn't back and having figured out that he's in trouble so head to the museum to rescue him. In the basement, Peter fixes the portrait by painting over the wool hat until it is an exact duplicate of the real masterpiece. Then Duce gets a call from the curator who tells them the warning bell has sounded for closing time and they should be at their post, so telling Peter that artist must suffer they gag and bind him to a chair. The other three arrive at the museum and split up to search in different studios ; in Studio 3, Micky encounters a finger (and foot!) painting artist, and in Studio 1, Michael watches Liberace make a smashing cameo appearance as a piano assailant (with a silver mallet, yet!). While the guards managed to switch the paintings, Micky, Michael and David finally find Peter bound and gagged in the basement, where they give him kudos on his beautiful copy of the masterpiece—until Peter tells him the painting was done by a brilliant man, and they decide the painting was switched! Having freed Peter, they all return and try to convince the curator there has been a switch between the paintings, but the curator ignores their charges. Then they try to warn the guards until Peter explains that the guards are the perpetrators. They again try to warn the curator who doesn't notice Peter Tork's signature on the portrait, and explains an alarm that causes invisible beams (that can only be seen with special goggles) to surround the painting, which when breached will cause the thief to be caged and sent to jail in 5 seconds and he demonstrates this by turning on the alarm—eventually trapping himself in the process. Back at the pad, the guys decide to switch back the paintings and they prepare for their mission (Mission: Ridiculous); armed with a flashlight, a blowtorch, superduper X-ray glasses and three hot mustard and cheese on rye sandwiches, The Monkees deck out in catburglar garb and return to the museum late that night. Gathering our team of experts from the four corners of the earth, we’ll be a task force of Deadliness, Efficiency and Teamwork: The Manchester Marauder [David]. The Connecticut Counterspy [Peter] combines Nerves of Steel, Cool-Eyed Perception, and some Fancy Footwork. Their Abilities to Make Quick, Irreversible Decisions show why they were picked for this group. The Modest But Towering Texan [Michael] needs no introduction; his Stoiclike Ability to Endure Pain prove why he’s The Leader Among Men. Last, but not least, is The Los Angeles Leopard [Micky], known in Peoria as The Pantherman, and somewhat hampered by Low Resistance To The Night Air; he is the Only Weakling in Our Chain. There at the museum, they clumsily break in from the roof, enter the building down a rope ladder, and commence with their plan. With the aid of his superduper X-ray goggles, David easily manages to dodge the beams and removes the phony portrait but Peter left the real portrait on the roof and quickly climbs back up the rope ladder to retrieve it. Then Chuche shows up and the guys, unable to hide, make like statues and manages to fool Chuche who walks away (with their food!). After Peter climbs back down with the real portrait, Michael sends Micky and Peter to follow Chuche which they do without being seen while Michael and David switch the paintings back. After the deed is done, they prepare to climb up the ladder to escape, but then Duce discovers the ladder and climbs down armed with a gun; Chuche corners them with a gun too. Soon the guys flee in different directions and there's a wild chase set to “Randy Scouse Git” as the guys fight off the two guards and the finger and foot artist and ends with The Monkees and the two guards all caged up. The next morning as the curator is showing the exhibits to a crowd of people, they stumble upon all six of them still in the cage now sound asleep. Back at the pad, Peter having given up painting for good, has found a new hobby in building things. Then just as Micky sits in a chair that Peter had built, it immediately collapses under him! The Monkees finish by singing “Day Dream Believer”—and Liberace completes his assault on his piano. John Stewart's “Daydream Believer” (billed in “Art, For Monkee's Sake”'s end titles as “Day Dream Believer”), which would become The Monkees' third and final visit to the #1 spot on the charts, makes its debut appearance here. Its musical sequence was filmed during a tiring session at the Fred Niles film studios on a rainbow-backgrounded set in Chicago in August 1967, along with a number of other musical sequences. 2 color stills from the number were shot appropriately for inclusion on both sides of the sleeve of the Colgems #66-1012 single, which had “Daydream Believer” b/w “Goin’ Down”; they were also used for the sleeve of the French copy of The Monkees' sixth single, "Valleri" b/w "Tapioca Tundra" (RCA Victor Hit Parade #49-954). Writer Coslough Johnson and director Alex Singer would once again combine forces to deliver Episode No. 49, "The Monkees Watch Their Feet". The second episode filmed for The Monkees TV series' second season, “Art, For Monkee's Sake” was the first to be produced featuring esteemed character actor Monte Landis. Throughout the entire first phase of second-season filming (April-June 1967), Landis appeared in all but 3 shows: Episode No. 33, "It's A Nice Place To Visit...", No. 34, "The Picture Frame" (a.k.a. "The Bank Robbery"), and No. 49, "The Monkees Watch Their Feet". Look carefully at Michael when he says, "Oh, nobody but a fool would paint in the basement!" If you read his lips closely, you will notice that he originally said "Oh, nobody but an idiot would paint in the basement!"! The portion of this episode's audiotrack retaining the offending epithet "idiot" was erased and redubbed—for Peter's sake. Also, listen carefully for Michael Nesmith's post-tonsillectomy voice, which can be heard twice - the first time it's the re-dubbed "idiot/fool" line, and the second time during the "narration" for the "Mission: Ridiculous" scene. Also, music producer Douglas Farthing Hatlelid gets screen credit on The Monkees as Chip Douglas for the first time. “Art, For Monkee's Sake” first aired on Beatle John Lennon's 27th birthday. A future episode, No. 55, "The Monkees Mind Their Manor", would air one day after George Harrison's 25th birthday. Episode No. 51, "The Monkee's Paw", was repeated on NBC on the eve of Paul McCartney's 26th birthday (No. 5, “The Spy Who Came In From The Cool” , was repeated on the day after his 25th), and NBC reaired Episode No. 50, "The Monstrous Monkee Mash", on the day following Ringo Starr's 28th birthday. 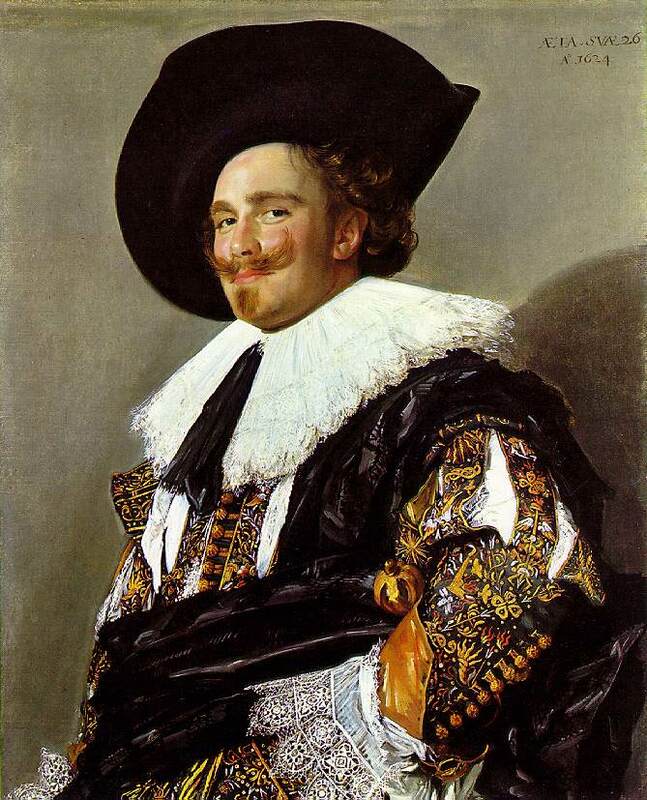 The name of the painting Peter duplicates is none other than Franz Hals' The Laughing Cavalier (1624). The title “Art, For Monkee's Sake” is a play on the phrase “art, for art's sake” (ars gratia artis). In fact, “Art, For Art's Sake” happened to be the former title for this episode. Towards the final minutes of “Art, For Monkee's Sake” Michael can be heard singing “Papa Gene's Blues.” The song would be heard again this season 2 episodes later, in Episode No. 39, “Hillbilly Honeymoon,” in an artificially extended mix. Here, in the museum break-in sequence, The Monkees wear black turtleneck shirts (with the exception of Peter, who wears a black long-sleeved T-shirt) and blue slacks. In Episode No. 58, "Mijacogeo" (a.k.a. "The Frodis Caper"), The Monkees' series finale, the boys don the same shirts (except now, it is Michael who wears a black long-sleeved T-shirt) and black slacks. In his voiceover narration at the beginning of the the museum break-in sequence, Michael explains the nationality of each Monkee except Peter, who is called "The Conneticut Counterspy"....when he's actually from Washington D.C.! 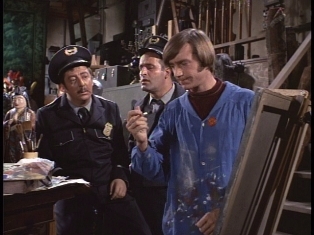 In Act 2 and 3 of “Art, For Monkee's Sake”, David is seen wearing a blue shirt which is closely identical to the one Peter wore in Episode No. 20, “The Monkees In The Ring”, and No. 29, “The Monkees Get Out More Dirt”, and Micky will wear in No. 58, "Mijacogeo" (a.k.a. "The Frodis Caper"). Notice the gold shirt Micky is seen wearing and is eventually painted on (and charged for $1500!) by the Artist (Michael Bell). Micky previously wore it in the premiere episode, “The Royal Flush”, in which he is pursued by Sigmund (Vincent Beck) during the “This Just Doesn't Seem To Be My Day” romp; the shirt was also worn by Peter in Episode No. 20, “The Monkees In The Ring”, in the scene where while he's picking away at a banjo (for the first time on the show), and in No. 52, "The Devil And Peter Tork". The next time Micky sits on a chair which collapses under him will be in Episode No. 52, "The Devil And Peter Tork", in which Mr. Zero (Monte Landis), with a snap of his fingers, causes Micky's chair to fall apart under him! In the museum basement, check out the beautiful wooden blond shipmast, which will be seen in The Monkees' second-floor bedroom in Episode No. 43, "A Coffin Too Frequent", and No. 58, "Mijacogeo" (a.k.a. "The Frodis Caper"). For the second time Michael Nesmith and David Jones are seen wearing hats within a single episode, following Episode No. 10, “Here Come The Monkees” (Original Pilot Film). The hat David wears is the same one he will wear in No. 46, "The Monkees On The Wheel", as part of his guise as Muscles The Mauler. The late Victor Tayback (Chuche) went on to greater fame as Mel Sharples on the sitcom Alice (CBS, 1976-85) and in the 1974 Warner Bros. picture which spawned it, Alice Doesn't Live Here Anymore; his previous appearances on The Monkees were in Episode No. 4, "Your Friendly Neighborhood Kidnappers" (as George) and No. 16, "The Son Of A Gypsy" (as Rocco). Trekkies will recognise Tayback as Jojo Krako from the second-season episode "A Piece Of The Action" (#60349, 1-12-1968); he was also featured with Monkee guest alumnus Arch Johnson [“The Chaperone”) in the November 29, 1968 episode of Bewitched (ABC, 1964-72), "Samantha Fights City Hall" (#3911). Steve McQueen fans will recognize Tayback as Peter Ross, gangland chief who puts out a contract on his brother Johnny, who is under the protection of McQueen in the 1968 Warner Bros. cop classic Bullitt; he was also in the 1989 Tri-Star comedy Loverboy as jealous husband Harry Bruckner. Arthur Malet (Curator) was seen as mortician Ted Ulam in the Oscar-winner In The Heat Of The Night (United Artists, 1967) (which also featured Monkee guest actors Clegg Hoyt [“The Prince And The Paupers”], Eldon Quick [“Monkees A La Mode”], Peter Whitney ["It's A Nice Place To Visit..."], and Stuart Nisbet ["The Monkees In Texas"] in supporting roles) and Mr. Dawes, Jr., President of The Bank in Disney's Mary Poppins (Buena Vista, 1964). After appearing with Monkees guest alum James J. Griffith (also from "The Monkees In Texas") in the November 25, 1969 episode of The Mod Squad (ABC, 1968-73), "The Death Of Wild Bill Hannacek," Malet later played Ryan on Dallas (CBS, 1978-91) and Cornelius on Ned And Stacey (Fox, 1995-97). Malet passed away on May 18, 2013 at age 85. Trivia Footnote: On the same night Art Malet appeared as the curator in “Art, For Monkee's Sake”, he also turned up as The White Hunter in the "Prince Of Darkness Affair" (Part 2) episode of The Man From U.N.C.L.E. (NBC, 1964-68), which immediately followed “Art, For Monkee's Sake” on NBC! “Art, For Monkee's Sake”'s director, Alex Singer, previously directed Malet in a December 16, 1966 episode of U.N.C.L.E., "The My Friend The Gorilla Affair" (prod. #8440). In 1974, Michael Bell (the artist) and Micky Dolenz were recruited by Hanna-Barbera to voice the title characters (Ernie and Todd, respectively) of Devlin (ABC, 1974-76). Aside from a host of voice over work, including as Mark on Speed Buggy (CBS, 1973-75), and Grouchy, Handy and Lazy on Smurfs (NBC, 1981-90), both Hanna-Barbera productions, Bell also portrayed Les Crowley on Dallas (CBS, 1978-91). Trivia Footnote: “Art, For Monkee's Sake” director Alex Singer later directed Bell in an episode of Mission: Impossible (CBS, 1966-73), "The Exchange" (1/4/69), and later the December 7, 1978 installment of David Cassidy - Man Undercover, "Flashpoint." Liberace is one of only four guest stars on The Monkees to ever play himself, aside from KRUX-AM DJ Bob Shannon's cameo in Episode No. 32, “The Monkees On Tour”, director Jim Frawley's appearance No. 54, "The Monkees In Paris" (a.k.a. "The Paris Show"), and Jerry Blavat's guest shot in No. 56, "Some Like It Lukewarm" (a.k.a. "The Band Contest"). (Or 7, if you wish to count the appearances of Charlie Smalls, Frank Zappa and Tim Buckley in the last 3 episodes of the season.) Liberace previously turned up as Chandell/Fingers/Harry in the high-rated 2-parter of Batman (ABC, 1966-68), "The Devil's Fingers/The Dead Ringers" (prod. #9721, Oct. 26-7, 1966), making him the second of three "Special Guest Villains" on Batman to appear on The Monkees' TV show, following Julie Newmar (The Catwoman)'s appearance in Episode No. 29, “The Monkees Get Out More Dirt”, and preceding Burgess Meredith's cameo as The Penguin in No. 57, "The Monkees Blow Their Minds".